This project is an archive, highlighting the women of color who helped shape the concept of feminism, as we know it today. This archive is a multi-media resource, and consists of pictures, links (which will be in red, like this: example), gallery sliders (which is a gallery with multiple images that the reader can interact with by toggling the left and right arrows), and block quotes. This archive also links to outside sources from the women featured in the archive, as well as other sources. I encourage you, the reader, to explore any and all of the outside sources in order to obtain some perspective, and examine all the great works that are featured in this archive. Simply scroll through and interact with this archive by clicking on the links in red or navigating through the image gallery slider by pressing the arrows. I hope you enjoy reading this archive as much as I enjoyed making it! Except, what’s missing from this picture? Susan B. Anthony, Eleanor Roosevelt, and Gloria Steinem are all white. In fact, I'd wager that you'd have to think fairly hard before you could come up with three women of color that contributed to the development of feminism. But the reasoning behind that isn't because there aren't women of color who revolutionized feminism, in fact, it's quite the opposite. It's because white women have always taken precedence over non-white women. And that is what this archive attempts to rectify and highlight: include the women of color who made feminism what it is today. Additionally, this archive strives to amplify the voices and stories of the women who were silenced, excluded, or flat out erased during the birth of feminism. This archive consists of five biographies of exceptional black women who were imperative to the concept of feminism, as we know it today. All of these women contributed to the creation of the notion of feminism, often in remarkable ways. I hope this archive will contribute to the discussion of inclusivity and diversity in the sense that it hones in on the diversity of race within a specific gender, both of which were—and still continue to be—oppressed. Additionally, my hope is that this archive will serve as a testament to how powerful and influential these women of color were to, not only feminism, but to women and equality as well. Before, we jump into the power players who shaped modern feminism, it's important to conceptualize feminism and give the history behind the phrase "white feminism." The phrase "white feminism" is used to describe the challenges that white women faced, without talking about the obstacles of oppression that women of other minorities, that lacked privileges, faced. Mariana Ortega's essay "Being Loving, Knowingly Ignorant: White Feminism and Women of Color," breaks down this ideal nicely. Ortega starts the essay with an anecdote about Audre Lorde speaking at a panel about feminism in 1979; she writes how Lorde is one of the only African-American women who have been invited, and while this conference that Lorde is speaking at is centered around feminism, Lorde wonders "how the audience deals with the fact that women of color are cleaning their houses, and taking care of their children." "Why is it then that the list of respected women of color is still so short? 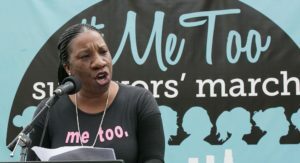 Why is it that feminists still scramble to fill out the spot for the respected, well-known woman-of-color speaker that will bring in a crowd?" This idea of women of color still being pushed to the side to make way for white women, except to pull them back out when its convenient is exactly why I chose this specific topic to build an archive around. We cannot say feminism in all inclusive and intersectional while still continuing to talk over, and talk for women of color. I'd like to end this introduction by encouraging you to read not only Ortega's essay, but also the works that all of the women mentioned here published, in order to get a better understanding of how we can all truly be feminists that all fight for one another, instead of simply fighting one another. Additionally, I'd like to share a particularly moving quote from Audre Lorde that sums up the true ideal of feminism, and what it was established for. Additionally, to help conceptualize feminism and how it ceases to include women of color—specifically black women—I found a video that summarizes it pretty well. As the video explains, feminism has often times left women of color out in the cold in terms of equality, when black women were always the ones doing all the work, and why different branches of feminism have grown in popularity over the years. In this archive, I hope to bring to light a few of the exceptional black women that have made room for the gender equality we have today, as well as raising awareness to how sometimes different women have different shackles that hold them down, and different glass ceilings they have to break. Encyclopedia article about Angela Davis, educator and civil rights activist, who gained notoriety in the turbulence of the late 1960s as a member of the Communist Party and associate of members of the civil rights group the Black Panther Party. She was implicated in a daring prisoner escape that resulted in several deaths but was later exonerated. Davis is a university professor and widely recognized scholar on racial politics. Angela Davis before a microphone during a speaking appearance. bell hooks speaks on campus at UW-Madison. Photograph of author Alice Walker sitting in a peach-colored chair. She wears a black sweater and eyeglasses. She rests her head on her left hand and looks toward the right. 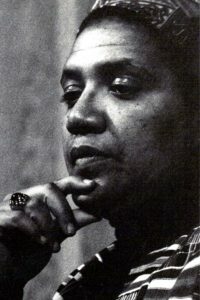 Walker is an African American novelist, short-story writer, poet, essayist, and activist. Her most famous novel, The Color Purple, was awarded the Pulitzer Prize and the National Book Award in 1983. Auburn Avenue Research Library Historic African American Education Collections received support from a Digitizing Historical Records grant awarded to the Auburn Avenue Research Library for African American Culture and History and the Digital Library of Georgia by the National Historical Publications and Records Commission. Box 4 Folder 89, Item, series, Annie L. McPheeters papers. Archives Division, Auburn Avenue Research Library on African-American Culture and History, Atlanta-Fulton Public Library System. St. Lawrence University: Street Art Graphics; Black and white portrait of Audre Lorde (1934-1992), a Caribbean-American writer, feminist, womanist, and civil rights activist. Her work focused on sexuality, social liberalism, and revolution. I cannot tell you how many revisions my archive have undergone before becoming the information resource you see before you. Originally, I had wanted to do something along the lines of discrepancies within ads for men and women, and focusing on people of color within that. However, I came across many obstacles with that idea. The first being that it didn’t find genuine or mine because it was so similar to another former student’s project. Another obstacle was that it was extremely hard to find sources that I could use and had the right criteria. So then my archive underwent a new change: I would focus on magazines geared towards black women, and examine the differences in topics presented on the first page when women were wearing their natural hair versus wearing a hairstyle achieved with heat. I decided to focus on the magazine “Essence” and look at their covers over the decades, and have that be the basis on my project. I wish that was the end, and I was able to carry on with my intended project. As I expected, but deep down in my heart hoped against, the permissions for image use was pretty strict, I had to get explicit permission to use such images, and with Essence being such a big magazine, I knew the chances of them not only seeing my email, but actually responding to it and giving me permission, were next to none. I knew I wanted to do something that focused on women of color and their stories being silenced, but I just didn’t know what. But somehow—maybe by some stroke of luck, or the universe cutting me some slack—I got inspired. I was going to build an archive of the influential black women who were imperative to the development of feminism, as all you ever hear are women like Cady Stanton and Susan B. Anthony. From there, I was on a roll. I already knew a bunch of black women who crucial in the advancement of feminism, and while I wanted to include every single one, I knew it wouldn’t be plausible. So I decided on Angela Davis, Alice Walker, bell hooks, Audre Lorde, and Tarana Burke. As it turns out, the DPLA and Wikimedia Commons were a lot more helpful in producing images for historical figures like Audre Lorde and Angela Davis than men in 1960s ads to Essence magazine covers. I would even go on to say that compiling the images for my archive was one of the great successes of my project. In addition to the aforementioned resources, I also looked for pictures that were labeled public domain online in order to get a broader range of images for my archive. Another success I would attribute to my archive was that I was excited and eager to do it. Whenever I found something else I could include, I was genuinely happy. Passion will always be the best motivation for me, and I think this archive was the most passionate I’ve been about an assignment in a while, which was both beneficial to the archive and to myself. Of course, we cannot have successes without limitations. The first limitation of my archive regards the biographies of the women I chose to feature. The lives of these women are beyond spectacular, and a simple paragraph would in no way do them justice, but I didn’t want to write a whole novel in my archive because, at the end of the day, I wanted my audience to be engaged with the content, and a wall of text might’ve deterred them from my project. Along those same lines, I wanted to highlight these women and their amazing contributions—but I didn’t want to speak for them; I didn’t want to tell their stories for them. This is something I struggled with a lot when constructing their biographies, because in the end, I want my archive to capture my audience’s attention and then want them to do their own research on their own, which will hopefully lead them to the works that these 5 exceptional women published themselves. If I had more time to work on my archive, I’d bring out all the stops. I would construct a timeline for all the notable events that happened in each of the 5 womens’ lives, but given the time frame, it wasn’t plausible this time around—though a girl can dream. Furthermore, if given more time, I would also go into more detail about the effects they had on feminism and intersectionality they had, as it was remarkable what they did during a time period where just about everyone wanted to silence them. Overall, to say I learned a lot when building this archive is an understatement. Not only did I learn about the technical aspects of this archive like copyright and license terms, and how to make a picture bigger in the shortcode, I also learned how formatting and content contributes massively to the narrative one is trying to portray. If I was to use timelines instead of gallery sliders, my archive would tell a completely different story. Finally, the biggest thing I learned about was diversity and how overlooked it is. No one blinks at eye at the fact that the major women mentioned in the development of feminism are namely all white. You really have to look beyond what society has conditioned us to think to realize the greatness in these monumental revolutions, which is a lesson learned from building this archive that I know I will keep. This archival exhibit was created by Dara Sostek in Literature and Digital Diversity, Fall 2018.